In this article, we will walk you through the process of creating a Facebook campaign from a Yieldr Air segment. If you don’t already have a Facebook advertiser account, click here. If your Facebook advertiser account is not connected with your Yieldr Air account, please read the article here to set up the integration. Using the Flights page, you can easily identify underperforming inventory in your network. For example, if there is a route that has a lower load factor than you expected in the last month, you can select these routes for Facebook retargeting. In this example, we select three routes we would like to target (MEX-LHR, MEX-AMS, and MEX-MAD). Once these are selected, we can click the “View Audience” button to learn about potential customers for these three routes. From here, we can refine the audience of potential customers looking at this flight. Here, we are selecting all users who made it up to the payment stage before leaving the website. This can be done by clicking Show Advanced Filters. After selecting the filters you would like, be sure to press Apply Filters to recalculate the audience. 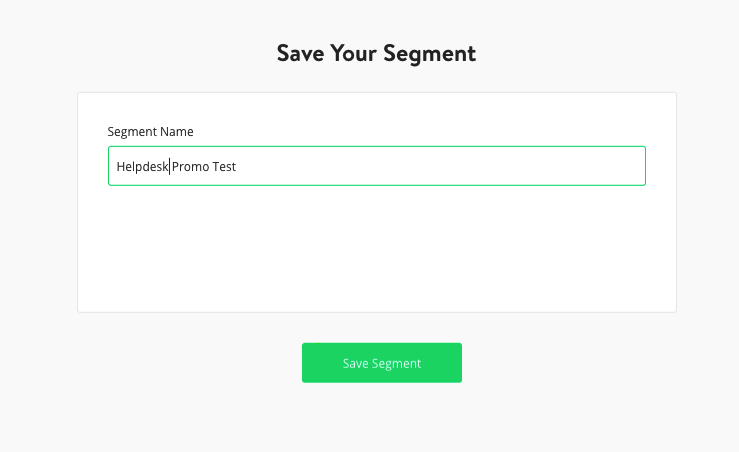 Next, click Save Segment in order to name your segment. We can now see the segment listed on the segments tab. Click Export . Click Export on Facebook Ads. We can now see that the segment has been exported correctly to Facebook. Initially the Facebook logo in the “Exported To” column may show a “pending” symbol, but the export process should be done within 30 minutes. Login in to your Facebook Business Manager Account. Your segment should now be visible. You can view it by clicking the menu icon on the upper left part of the screen and selecting Asset Library. Now we are ready to create a campaign based on this segment. Click [the name of your segment ] > Actions > Create Ad. This brings us into the Facebook campaign builder. From here we can set objectives for our campaign, choose the type of campaign to run, select creatives, and run the ad itself. Once you have imported a segment from Yieldr Air into Facebook, you can expand the number of users you target by creating a lookalike segment. This can be useful if you have a small amount of users in your original segment. Now you can build your lookalike audience. 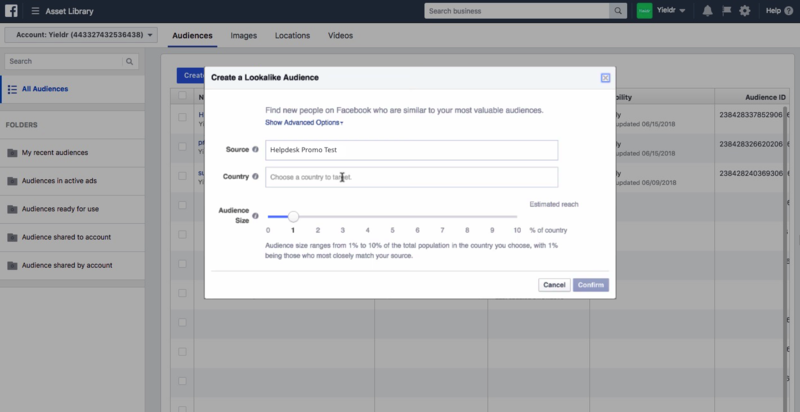 Select which country or countries you would like to target, then determine your audience size. Once this process is done, you can create a campaign for your lookalike audience. 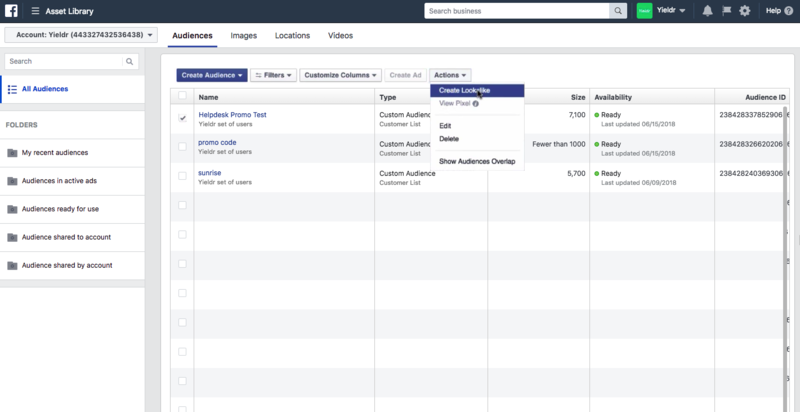 Facebook will begin to create your lookalike audience. This process may take 6-24 hours to complete. You should then be able to see it in your asset library. Users are continuously streamed to Facebook. This means that if you make a segment of users who search for the route MEX-LHR departing in the coming September, it will continue to show ads for people who make the search. In short, people who search for the route on your website after you export the segment will still be shown ads. Facebook requires you to have 20 matched users in each segment, however they recommend having at least 1,000 users in your segment for it to be worthwhile.. Not every email address we collect will match with a Facebook user profile. When you create segments, try to build segments larger than 1,000 users in order to have a large enough audience size. Exporting segments to Facebook is pretty quick, but not instant. It may take a few minutes for your segment to appear in your Facebook account. If your segment does not appear within an hour get in contact with us for support. 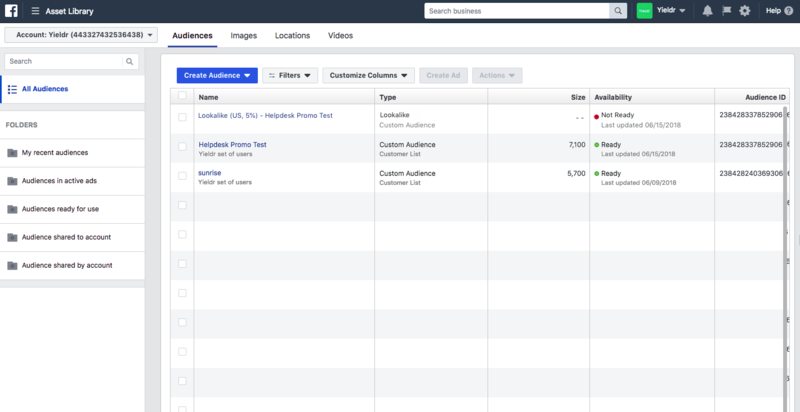 Lookalike segments in Facebook will continue to be updated every 5-7 days as long as you are still running ads. If you are experiencing any issues exporting segments to Facebook, read this article, otherwise feel free to contact us.